Figure 1. 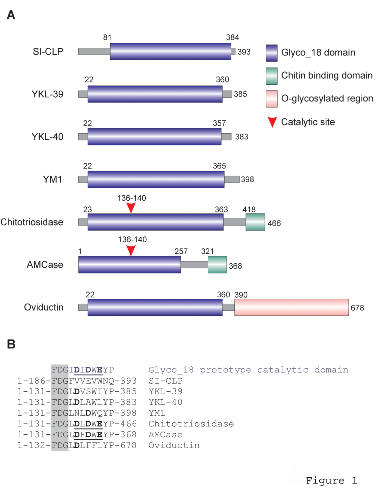 Family of mammalian chitinases and chitinase-like proteins (CLP). (A) Domain organisation of mammalian Glyco_18 domain containing proteins; (B) Critical aminoacids in the catalytic sites. The characteristic FDG sequence preceding catalytic motif is shown in shadowed box. Catalytic aminoacids are shown in bold. Complete active catalytic motifs are underlined. This research was originally published in Blood. Kzhyshkowska, J et al. Novel stabilin-1 interacting chitinase-like protein (SI-CLP) is up-regulated in alternatively activated macrophages and secreted via lysosomal pathway Blood. 2006; 107:3221-3228. © The American Society of Hematology.